The Holiday Inn is an old favorite on the global hotel scene and the Lisbon-Continental is no different. Expect a standard array of hotel facilities and service with a smile. 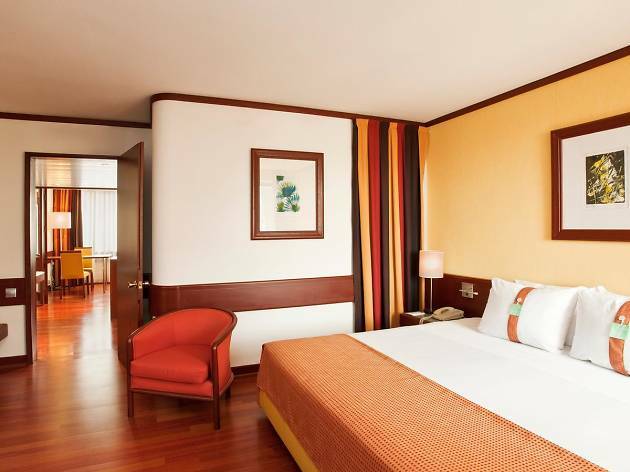 The 220 rooms at this Holiday Inn offer comfy beds and are decorated in a warm color scheme with parquet floors. Conveniences include an electric kettle, work desk, pillow menu and complimentary tea and coffee, plus the staff can whip up a packed lunch if you’re short on break time during the day. A full American-style buffet breakfast will keep you stuffed for a day of exploring, and the onsite restaurant, Coffee Shop, serves lunch and dinner. After dark, nip over to the City Bar to catch a footy game with a beer or cocktail. If you’ve got the family all in the same room, kids can stay and eat at no cost up to age 17. Then if you’re out and about with the young ones, you can feed kids aged 12 years and younger for free at any Holiday Inn restaurant in the city. The staff at the Holiday Inn pride themselves on good service so expect to be greeted in cheery fashion and don’t hesitate to ask if you need a hand booking tours or transfers. If you feel in need of a personal spruce up, you can also get the staff to book you an appointment with the onsite barber or beautician. Location: The hotel is located outside Lisbon’s main tourist hub, but a 20-minute metro ride from Campo Pequeno will deliver you downtown. The surrounding streets make up Lisbon’s key commercial district so there are plenty of shops and cafés at your disposal. Jardim Zoológico de Lisboa: Lisbon’s renowned zoo is just 500 metres away from the hotel. Here you’ll find a diverse range of animals, including gorillas, elephants, dolphins and lemurs. Sam Croissants: A prized pastry shop hides unassumingly near the Entre Campos metro station, a ten-minute walk from the hotel. As the name suggests, Sam does one thing and does it well, so grab a loaded croissant to kick your hunger. Campo Pequeno Stadium: This is the official home of Portugal’s bullfighting scene. Even if you’re not into the gory sport, the red-brick building is a spectacle in and of itself, and you can also catch other events here or wander the shops and food court downstairs. 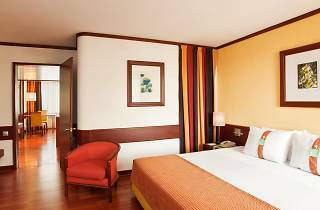 Good for: The Holiday Inn is good for business travelers and leisure travelers alike given its location just five kilometers from the Lisbon airport. Families are well catered for too. Time Out tip: If you’re travelling in a group, the hotel can book fado (traditional Portuguese music) performances on request.